Gladstone School has a long clean-up ahead of it after a flash flood swept through on Monday night. 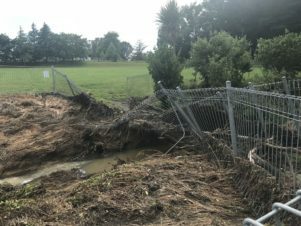 At around 6pm, the Gladstone area was hit by heavy rainfall that took out two bridges, flooded the bottom part of a house and washed under a number of the school’s buildings. Gladstone School principal Margaret Hyslop said the damage showed just how powerful the water was. “Our school bridge was washed out by the water and it’s also bent the metal fences. Damage to the school bridge means pupils won’t have access to their top playing field. Water also got into the swimming pool changing rooms, causing damage to the walls and leaving behind debris. Rain also poured through an air vent into the school’s toilets. While water washed under the school hall and one of the classrooms, Hyslop said that after checks the buildings appeared to be unaffected. The school remained open on Tuesday despite the flooding and Ministry of Education staff had made checks to assess the damage. She said the pupils hadn’t liked seeing their grounds flooded but it was exciting for them to see the power of the water. A kilometre away on Longbush Rd, Julie and Brent Nunn had water pouring into their garage and house. Julie Nunn said that around 6pm, water started flowing down toward them from the road. The water reached above her ankles in the wash house, bathroom and toilet and in the garage it went above her knees. The couple had several appliances caught in the flood including a washing machine, freezer and treadmill. 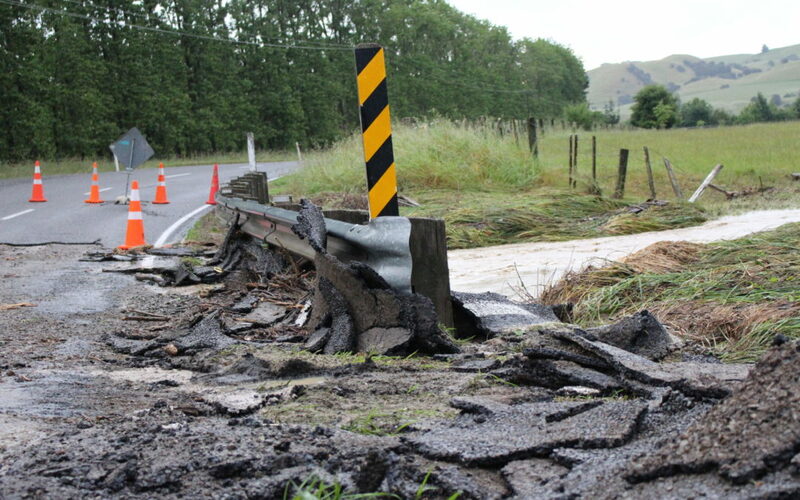 Tarmac was ripped from a bridge on Te Whiti Rd just south of the school. Police officers arrived at 6.33pm and directed traffic across the bridge, before it was closed at around 7.30pm. The bridge was reopened on Tuesday.